Inside Out is probably going to make you cry. Consider the facts. First off, it’s the latest from those miracle workers at Pixar, who are no slouches at getting the tear ducts working. Secondly, have you heard the premise? The film is literally about emotions, specifically the five personified feelings—Joy, Sadness, Anger, Disgust, and Fear—living inside the mind of a preteen girl, Riley, as she copes with leaving behind her happy life in small-town Minnesota for the hustle and bustle of a new one in San Francisco. 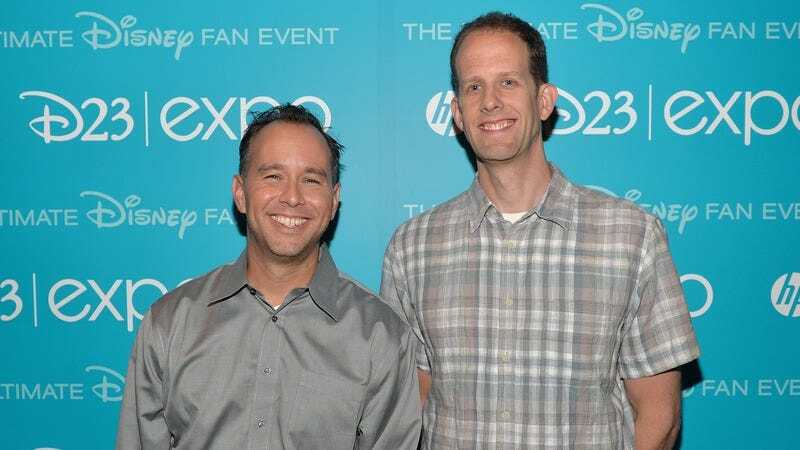 Thirdly, and perhaps most crucially, Inside Out reunites Pete Docter and Jonas Rivera, the director and producer, respectively, responsible for Up, best remembered as that kids’ movie that had you bawling uncontrollably in about 10 minutes flat. Are the two in cahoots with Kleenex or what? The lovely Inside Out opens on Friday, officially ending our long national nightmare of no Pixar movies for two years. (The last one, Monsters U, arrived in the summer of 2013; the next one, The Good Dinosaur, hits theaters this November.) In honor of the occasion, we sat down with Docter and Rivera to talk about pitching a (relatively) abstract family film, directing a production of this size and scope, and triumphantly flooding auditoriums with the tears of children and their parents. The A.V. Club: Inside Out is about as abstract as Disney-funded family films get. Was it a tough sell? Or are you both in the position at this point that you can just say, “This is what Pixar is doing next”? Jonas Rivera: [Laughs.] Oh, I wish we were in that position. Pete Docter: No we don’t! [Laughs.] If you’re talking about selling to executives, that’s one thing. We never really had any issues. Selling it to the audience, that’s different. We knew ourselves that it wasn’t quite working for quite a long time. JR: Pixar is really collaborative. We don’t go pitch and say, “This is the script of the movie we want to make.” It was a top-level pitch of this concept that we thought had tremendous potential. I think [Pixar chief creative officer] John Lasseter lit up over the idea of personifying emotions. Even when we pitched it to [Disney CEO] Bob Iger, we knew that this could be something we could own and forever define what, say, joy looks like. It’s like our seven dwarves! Everyone at the highest levels liked that. But now what do we do with it? That’s just an idea, that’s not a movie. So it was a tremendously long dance. PD: We have our writers and our story folks and everyone just works hard doing it over and over. Pixar has been pretty good from the beginning about being, like, we know you’re going to make mistakes. That’s part of the process. Go out there and do it. So for the first year and a half or two years, it’s like… [Makes sputtering engine sound.] you know, trying to start the motor. People believe in it, so everyone’s there to help. JR: We came off of making Up. And that was the harder one to explain how it got made. AVC: What kind of problems did you encounter developing the film? JR: “What a great idea,” they’d say. PD: We knew from the beginning that we wanted it to be about growing up, and the passing of childhood, and the difficulty of that. But how exactly do you make that practical? You have to find these metaphors for everything. It took a while to do—both in terms of Riley, as a kid and how to talk about growing up and how to represent that, but also Joy, and understanding her arc. Even naming the characters. I was dead set against naming them Anger, Fear, Sadness, Disgust, because it took away the subtext. It’s going to be so obvious! You know, Joy is having to drag Sadness around and understand Sadness—that’s what the movie is, I can’t name that! So let’s name them… Misty, and I think we had Ira for Anger. JR: Gretchen was discussed for a minute. PD: But that just got confusing. So obviously I was wrong about that. AVC: Did you think it would be easier for kids if they were just told what each character was representing? PD: Not for kids. For us. John and Andrew [Stanton] were saying, “I don’t understand. Who is that green one again?” Okay. I’ll just name her Disgust. Everyone knows what the concept of disgust is. Now we can start having fun with the character. In the very beginning, we decided we were going to dramatically introduce all the elements. And finally, that just got so cumbersome that we did voice-over. “Here’s what you need to know to enjoy the movie.” Let’s get all that over with. And of course Amy [Poehler] makes it really entertaining. She does the heavy lifting. AVC: Directing a big studio animated movie is a long, complicated process. You spent at least five years on Inside Out. As director of this massive production, what’s your day-to-day look like, Pete? PD: Really what happens is, there’s so much going on that I can’t be in charge of my own schedule. So Jonas will work with the production manager and my assistant to figure out how we finish the film. The movie needs to come out in two years. So right where we’re at now, what’s holding things up? JR: It’s a constant act of prioritizing the work. We identify the seasons of the production. So when we’re in the screening season, we get stuff approved and locked for production. Ninety percent of the time, it’s story and editorial crafting the reels, and everything kind of falls secondary to that. And then we move into designing and building the sets and building the characters, and that takes more time. We can’t ask Pete to make all these calls, because he might not know that this needs to be here by this time and we can’t get Amy Poehler until she’s done with Parks And Recreation and so this is tied to that, and so forth. By the time you’re at the height of production, every department is going, “There’s not enough hours in the day.” You have to sort of chop things down, sand away other meetings, pull things out, run things separately, send emails—every second is scheduled. It’s so glacial. PD: In terms of the storytelling, I’ve got a pretty good sense of what’s working and what needs help yet, and so Jonas and I will sit and talk through what I really want to hit and ways to do that. When it comes to production, I kind of just surrender that to these guys. Because they know much better than I do. AVC: How do you train yourself to see minute details like that? Is it just years and years of doing this? PD: Yeah. And trying to understand where the audience is going to be looking. If it’s an important story point, and we need a close-up of the glass being picked up, then I study that closely. If it’s nothing I even want people to look at, I’d rather I spend my money elsewhere. And there’s a certain amount of knowledge I have, having done it for a long time, of what’s going to be pricey, what’s going to take time. JR: It’s constantly prioritizing the work and knowing what gives you the bang for buck. And that drives the director’s schedule. AVC: One great thing about Pixar is how much trust you always put in your young audience. Kids can handle heavy emotional material, and they can handle stuff that’s a little scary. But how do you negotiate that line? Are there times when you have to walk it back, and go, “Maybe we got too scary with the clown stuff”? PD: I can’t remember ever pulling back on scariness. [To Jonas.] Can you? There must have been one or two. Maybe on Monsters Inc. Just the intensity level. JR: There’s been things like, “Oh, that’s a little harsh with the bear in Brave, or with the monsters in Monsters Inc.” So we’ll sand it down. But it’s pretty minimal. PD: I think they got a couple notes on Brave, in terms of the intensity of the bear fight. But generally, we just go for it, and it’s easier to pull back than to baby-step into it. I think that’s generally our approach for everything. JR: The clown was pretty ridiculous. We pushed pretty far. My kids got scared. [Laughs.] It’s great, I’ve horrified my child! AVC: How much do your kids become a barometer for your filmmaking? JR: Oh, I use my kids all the time. I show them clips, or bring them to the studio to see what they gravitate towards. Outside of the production office, we had a big light-up of the characters. I’d bring the kids in and just watch them run up to it. They’d laugh, especially, at Anger. It’s totally clear he’s working. So I don’t know, I use them all the time. PD: I remember on Monsters [Inc.], bringing a reel home, and my son, who’s 4 or 5, watching it, and right at the end, when Sully has to say goodbye to Boo, [my son] leaves. And I’m like, “Great, he’s bored at the emotional climax of the film.” I go to find him and he’s crying, because Sully had to say goodbye. I’m like, “Ohhh.” [Whispers.] Yes! [Laughs.] That’s kind of sadistic, I guess. As a filmmaker, though, it’s nice to be able to tell that it’s working. AVC: Is it your personal mission, Pete, to reduce America to a sobbing wreck? PD: [Laughs.] Yes! No, I just think that’s why you go to the theater. Not to cry necessarily, but to be emotionally connected to what’s happening. So we’re always looking for ways to reach out and connect with people, even if it’s a movie about cars or bugs. AVC: Are there any autobiographical elements in Inside Out for either of you? PD: For sure. I’m from Minnesota, I grew up there. I moved to San Francisco eventually. In Minnesota, everybody plays hockey, though I never really did. There’s also just stuff you collect in your life, and when it works for the story, you put it forward. JR: I think what feels autobiographical for all of us is that it’s literally about this resistance to grow up—either for ourselves or our kids. That’s something we all have in common. Every fiber of me is in this film on that level. And this wasn’t me specifically, but my wife grew up in a Navy family that was always moving. We were just looking for truthful things. We sit around and tell stories about our lives and our kids, and that stuff just seeps into the film through osmosis. AVC: A lot of family films come packaged with a message for kids, but this is one that speaks as much as much to the parents—telling them, essentially, that you can’t shelter your children from pain. It’s healthy for kids to feel sad sometimes. PD: On one hand, you definitely want to protect your kids. But you also realize that, “If I let them fail, they’ll learn and do it for themselves next time.” That’s a hard thing to do, because you don’t want them to fail—and I use “fail” in the sense of letting them do their homework instead of riding them about it every day. I remember when my wife and I had our first kid, we came home and we’re like, “From this day on, our job is to prepare him to go off and be successful on his own.” And that’s a weird thing to think about as a parent. Because what you really want to do is protect them—like “No, no germs!” and all that. So it’s on one level very counterintuitive and difficult, but it’s also important, I think. JR: The way I look at it is, our job is to let this kid go out on his own, but you always want to enjoy every single second you have. And the movie speaks to that. Of course, the message to the kids is don’t eat broccoli, it’s awful. PD: [Laughs.] Yes, that’s the theme of the movie.